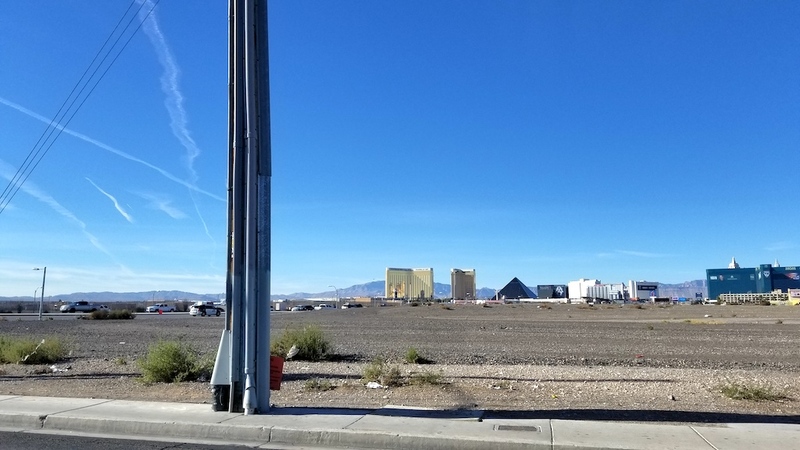 I was heading to Las Vegas, Nevada for CES, the world’s largest consumer electronics show. I was searching for inexpensive flights using my own flight search tips and came across fares on Frontier and Spirit. 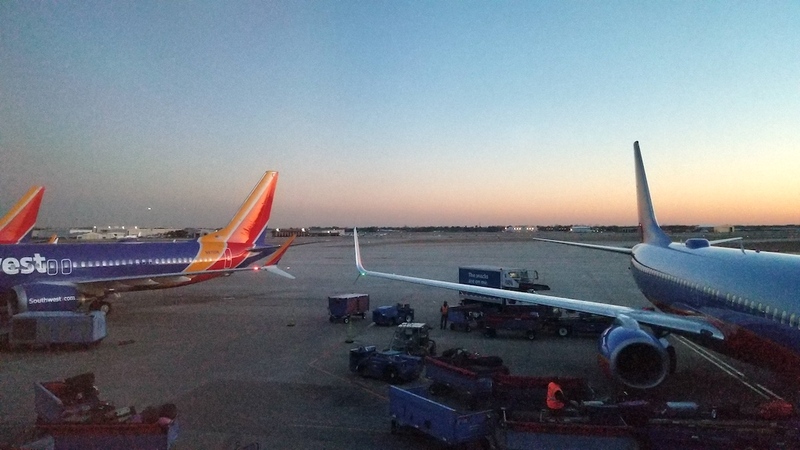 However, when I looked at other fares on United and Southwest, by the time I added the extras of bags and timings, the flight offered by Southwest Airlines worked out the best. I was this close to flying on Spirit, but waited too long and the fare skyrocketed; I was even willing to pay for my bag to avoid any hassles. 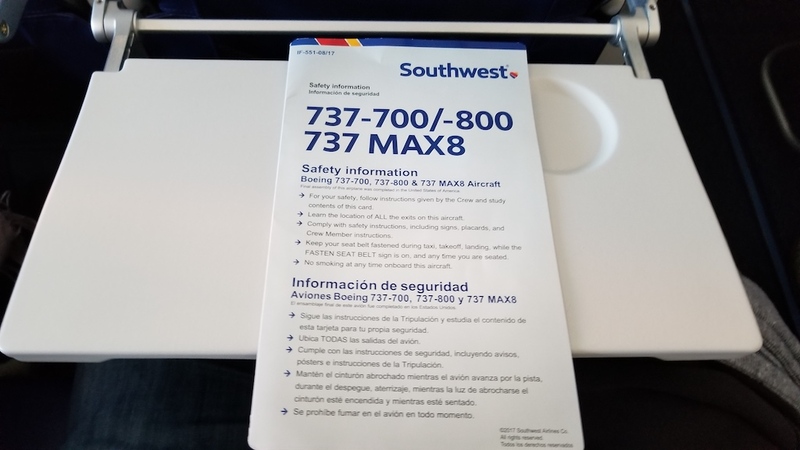 So here is my airline service review: Southwest Airlines (WN) Las Vegas, NV (LAS) to Houston-Hobby, TX (HOU) on the Boeing 737 MAX 8. You can watch the video of the journey here as well as read this post to find out how it all went. By the way, I did not know it was the MAX 8 until I got to the airport so I was pleasantly surprised. 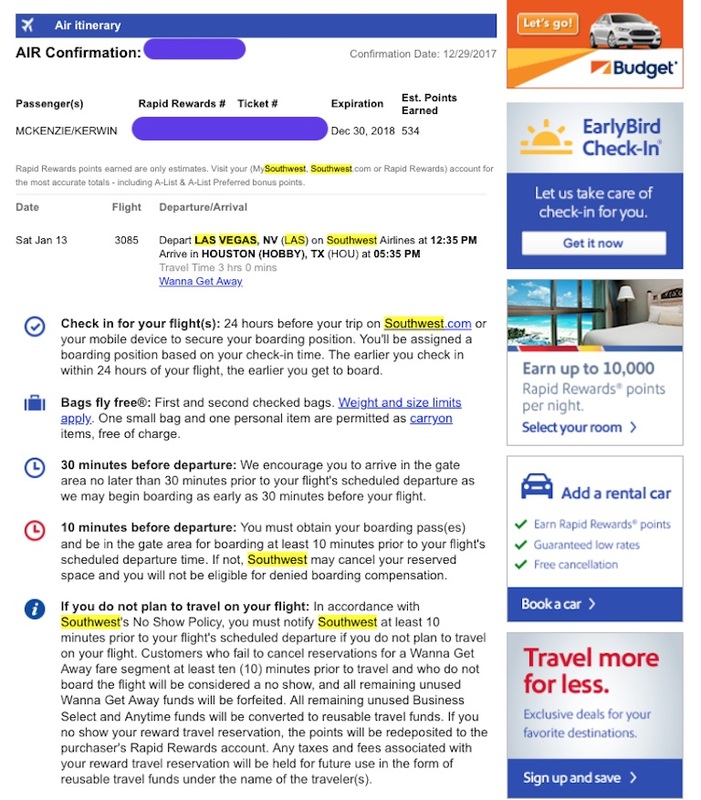 I started my search using Momondo.com as well as Google Flights. 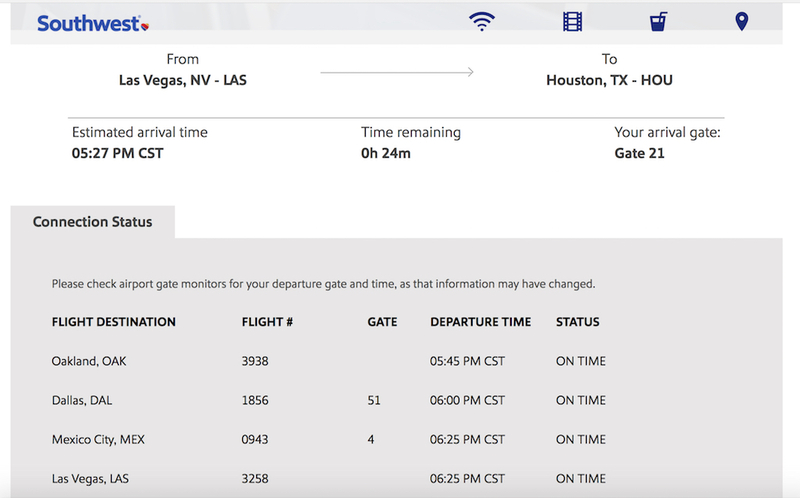 This gave me an idea of the airlines that serve the market (Las Vegas to Houston) and their flight times. 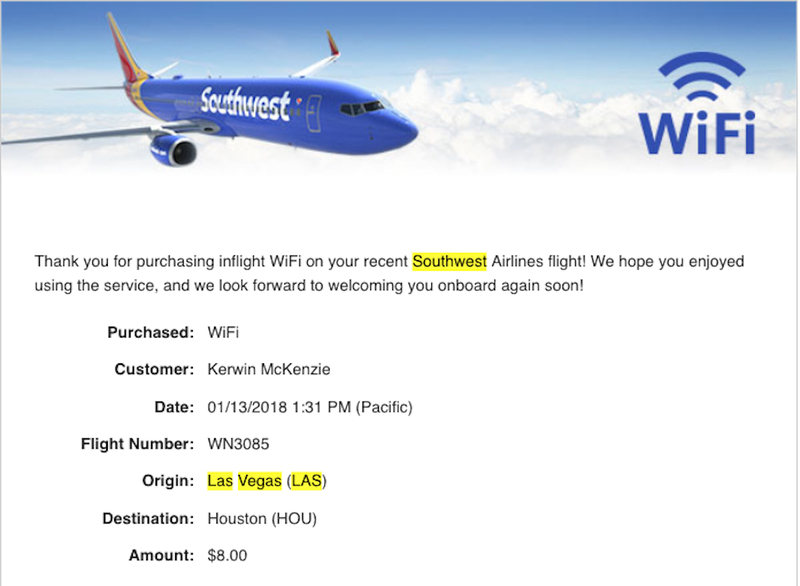 I then settled on Southwest Airlines and booked from their Web site. I booked the ticket on December 29, 2017, which for me is early as I usually book closer to my departure date. My flight date was January 13, 2018. 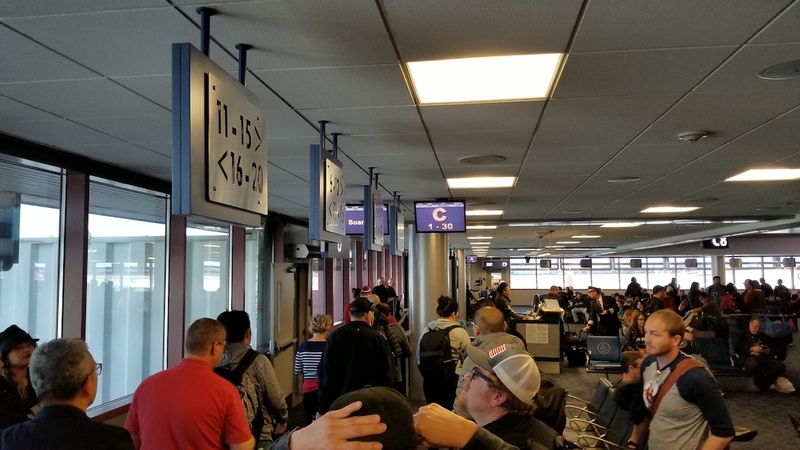 What I found is that a lot of these carriers have a low fare, but when you add up all the extras, paying for a seat assignment, paying to board ahead of others, upgrading to First Class, transportation to the airports they serve, it all adds up. So its not just about the low fare you see when you book. 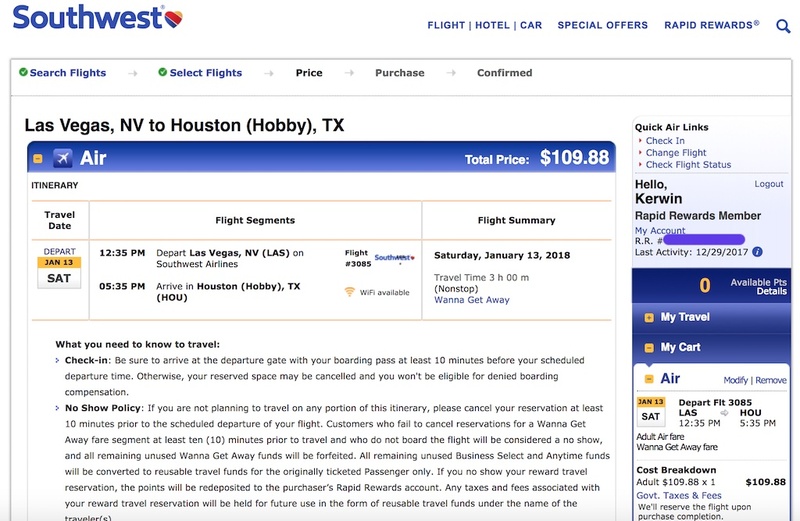 The airlines also want to upsell you to many things as the cost of the ticket alone cannot cover their cost for providing the service, such as hotels, car rentals and travel insurance. I actually highly recommend purchasing insurance for your trip by the way as you never know and you can be covered for a variety of issues. I now use Allianz for all my trips. Check them out here. It’s a very complex process and you MUST read all the details of everything before you buy. The good thing is that you have 24 hours to cancel and get a full refund. But read, read and then read some more. This is the best advice I can give you. 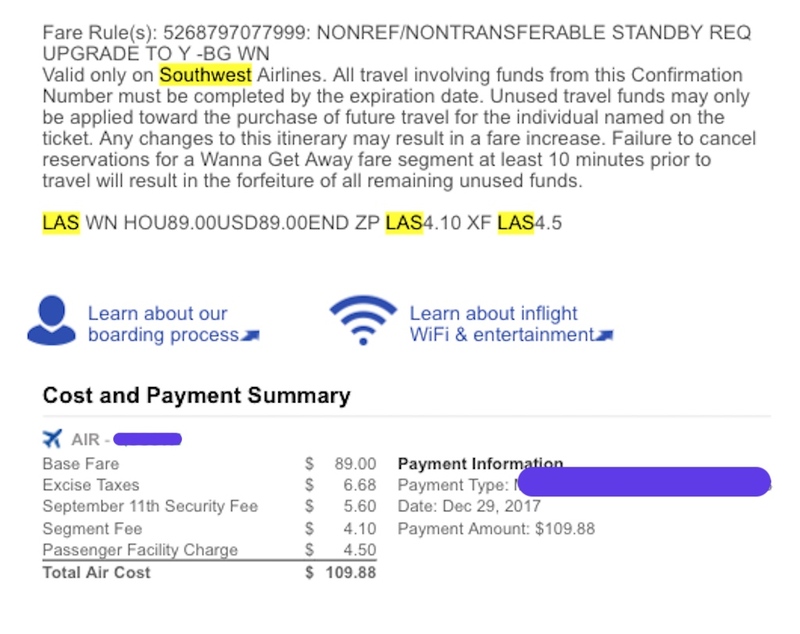 My final price for the one-way trip was $109.88, and I was allowed to check two bags free of charge. I was already a member of the Rapid Rewards program so I’ll get credit for this trip to my account. A win. I wold have preferred mileage credit to my KrisFlyer account with Singapore Airlines, but the United (United is a Star Alliance partner so I can earn KrisFlyer miles by flying United) fare was cost prohibitive for this leg of the journey. I did receive a receipt right away which detailed what I bought and broke down all the fare rules as well as the details of the fare I purchased. These were the same options that were detailed to me during the purchase process. I was still within my 24 hour window so if I did not like it, I could cancel without any issues. The email also had links to other offers related to my trip. On the 31st, I received an email with some trip information and offers to add car rental, hotels, etc. And on the 6th of January, I got an email offering car rentals in Houston. Thenon the 9th, I got an email recapping my flight details with options to do car, hotel, etc. as well as reminding me that I can check-in 24 hours before my flight. This is a good reminder as there are no seat assignments so its based on check-in time or if you bought any of the fare upgrade options. Of course I got busing in Vegas and did not check-in until the morning of my flight. I slept in for a bit and forgot about checking in, so when I finally did, I got position C23, which meant there’s be about 140+ people ahead of me, uugh… a middle seat for sure I’m thinking at this moment. I got myself together and then got a Lyft car service ride to the airport. It was shaping up to be a great day to fly. 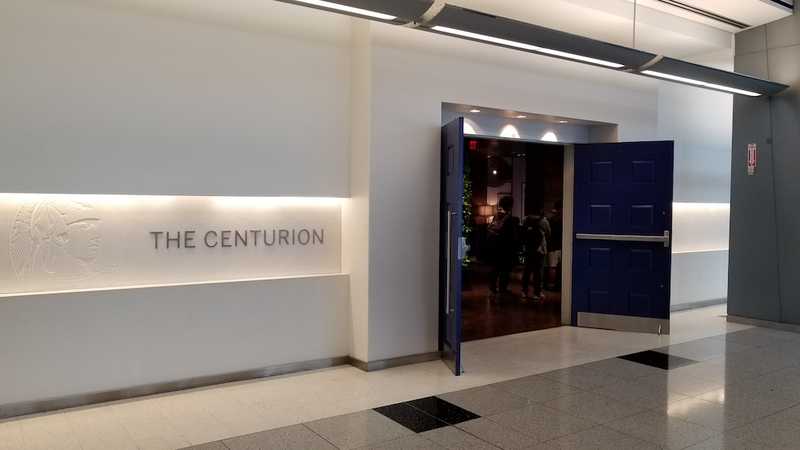 I also wanted to get to the airport earlier so I could check out the American Express Centurion Lounge in Terminal D.
At the airport, check-in was a breeze using the kiosk, although I had already checked in on the App. I wanted to see what the experience was like. 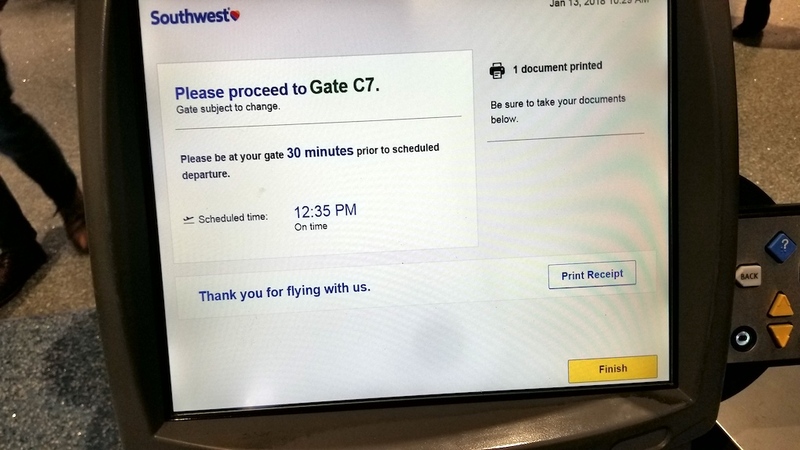 There were airport kiosks as well as kiosk provided by Southwest Airlines. I could have also tagged my own bag if I had one or ask an agent to help. I did neither and headed to the airport security area for Gate C.
I did not get TSA Pre, but despite that airport security was a breeze; not too many people I guess. I don’t think I had an option to enter my Global Entry number into my reservations during booking or check-in is the reason I think. I headed for Terminal D, so I could check out the American Express Centurion Lounge as its a perk of the American Express Platinum Card. The Lounge was a bit crowded, but served me well for breakfast. Plus it had create views of the airport operations as well. I’m a huge fan of Airport Lounges as I do a lot of work in airports and I do a lot of travel, so it saves me a lot of money. Some Lounges even has a space to catch a nap so that’s always a plus. Drinks, food, atmosphere, free stronger wifi does it for me. If you don’t have an American Express Platinum card, there are other options such as the Priority Pass which gives you access to several lounges worldwide. 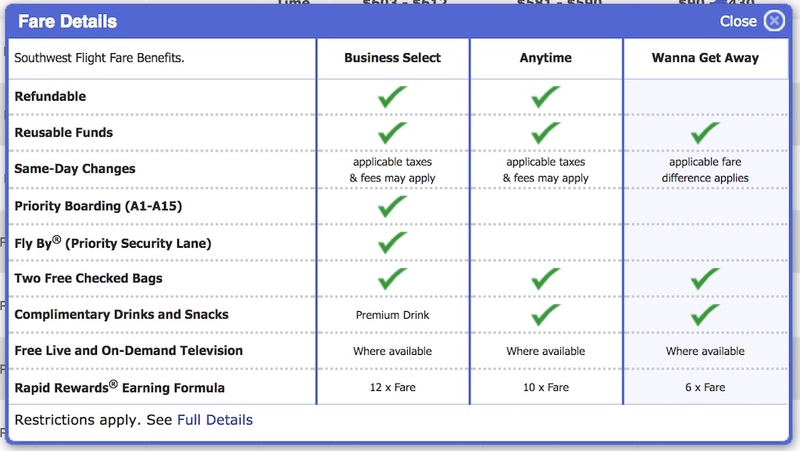 Airlines also have Lounge access based on the ticket you purchase, your destination and your elite level. Some credit cards also gives you access to Lounges and of course some Lounges have a pay as you need it entrance fee. So many options for you. After the visit and breakfast, I headed over to the Gate at C7. 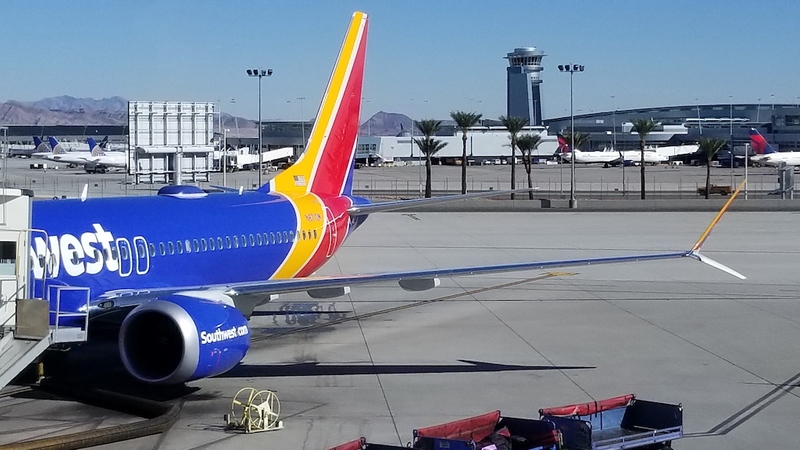 I of course went to see the airplane and noticed that it looked like a Boeing 737 MAX 8. From my vantage point it was hard to tell though. SO I asked the agent at the counter; she said for me to check with the agent at the gate. I did and she said no it was not. Not convinced, I found another vantage point, saw the registration number, searched online and voila! It is a MAX 8! I was of course elated. I then walked back to the counter and then the agent at the gate told me that it is as she had actually gone to check, how cool. The agent at the counter had a sign saying that you can upgrade to positions A1-A15 and people actually did. I had also received the same solicitation at the kiosk, but declined. Soon, it was time to board. First the 60 persons in Group A, then another 60 in B and then my Group in C. you line up by Groups of 30 and in order. It’s fun to see people actually ask each other what number they have so they are in order. I actually had to tell a lady to move further up as she had C8. I scanned my boarding pass which the agent kept as its open seating. First come first serve. I said hello to the flight attendant as I boarded who was quite cordial. 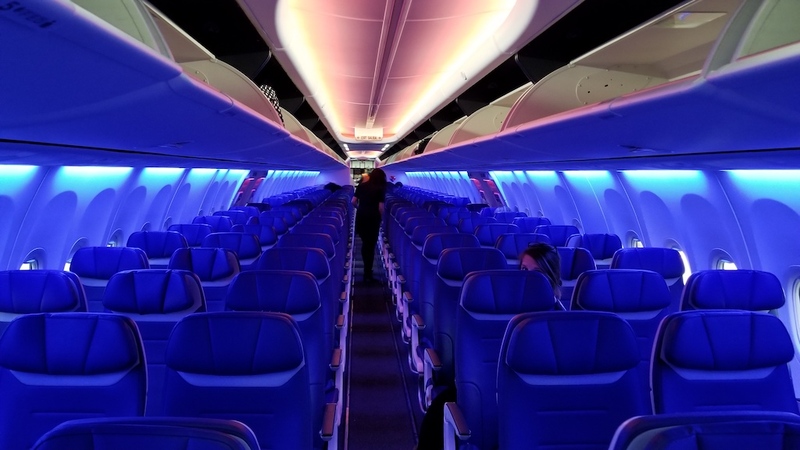 The aircraft was in a blue color as the flight attendants can change the color of the interior depending on the mood they want. 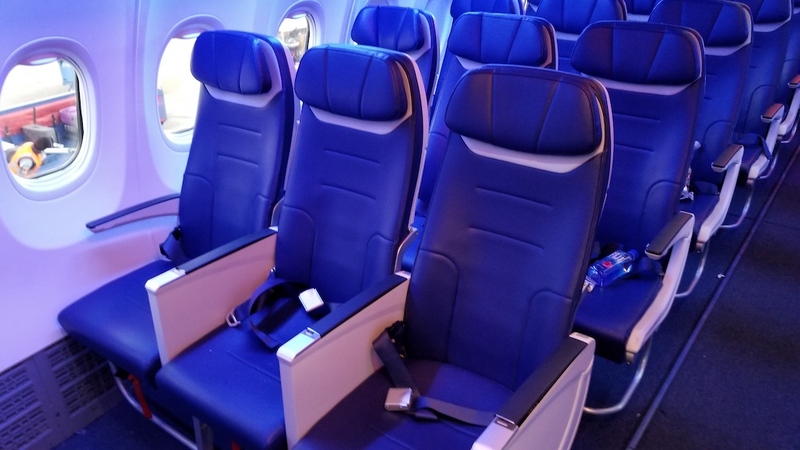 The aircraft has a 3-3 single class configuration; although there is a Business Select option which just gives you more amenities included in the pricing. I think the seats are the same though. Here’s the safety card for my aviation geek friends :-). I walked to the back as I know that it would be emptier and indeed it was and I was able to snag an aisle seat next to a nice couple. I would have preferred a window seat, but I guess I should have checked in when I got the check-in email ;). 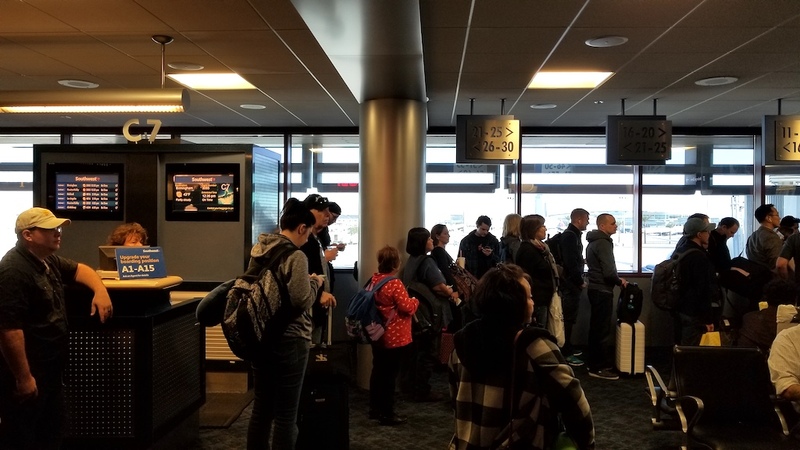 I settled in and watched as others boarded, came to the back seeing that its full and has to make their way back to the front to make their way to a middle seat. Soon after takeoff, the inflight service began. The flight attendants came and asked what we wanted, wrote them down and then delivered the orders. I did ask for a second cup of Ginger Ales and received it. I think I heard people asking for the cans and did receive them. 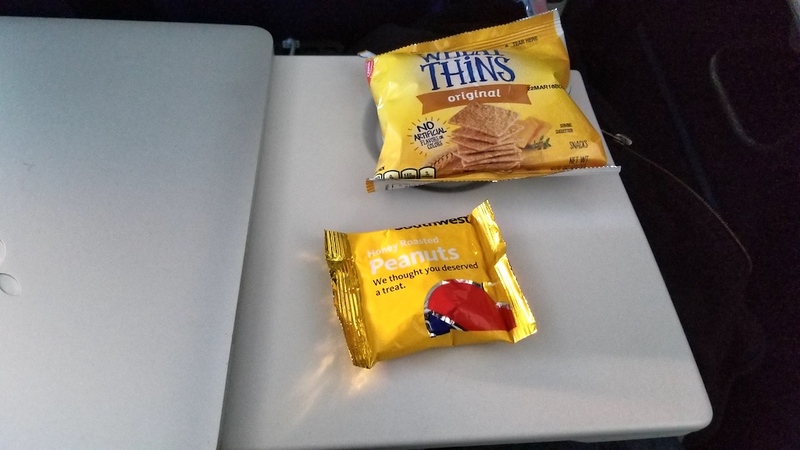 They also provided Wheat Thins and of course peanuts for which they are famous. I did notice though that the peanut packs were about 1/3 of the size they used to be. Cost cutting I guess. 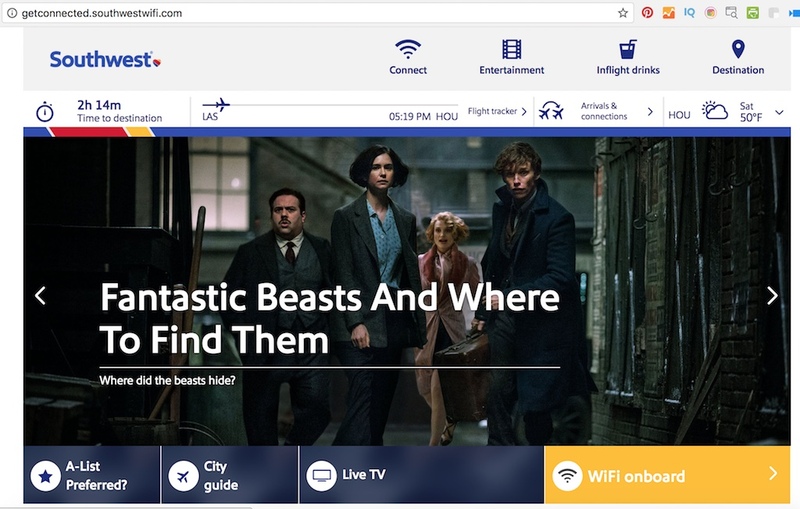 You can use your computer or your mobile device to connect to the inflight entertainment. 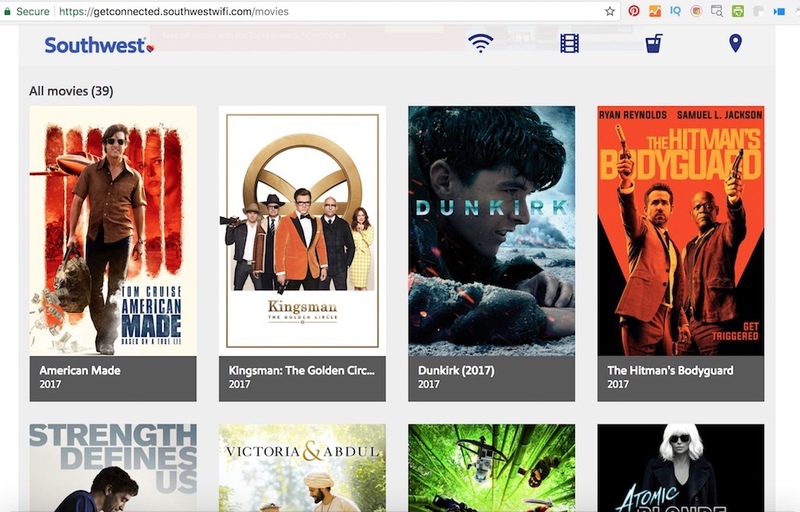 You can watch Live TV or stored movies and TV shows plus arrival and connection information. And my all time favorite, flight tracking so I can tell where we are and flight information. Soon, it was time to land and we started our descent. Landing was smooth and we had a short taxi to the gate. I snapped a few shots on exit, you can see them here and in the video as well. Also, the flight attendants and the cleaning crew was already reading the plane for the next leg. The Birmingham passengers of which there were only a few were told to stay onboard as this was a quick layover. 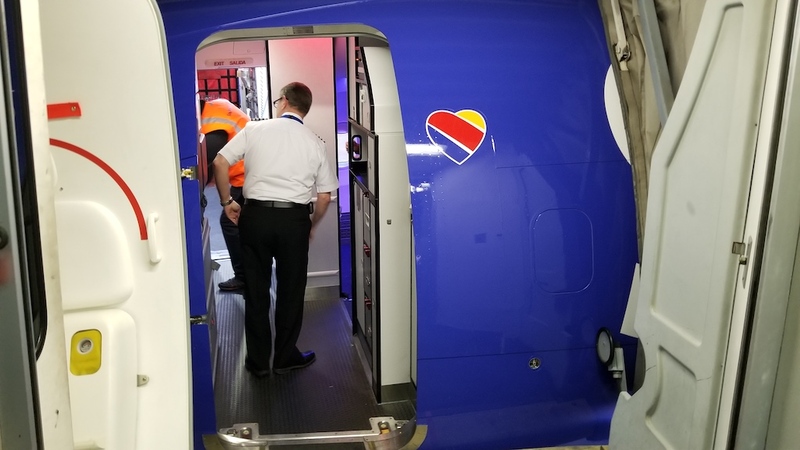 I had a quick chat with the pilot on exit and he said he enjoyed flying the new plane. All in all, it was a great flight and except for the Wifi, it went well. Have you flown this aircraft as yet? 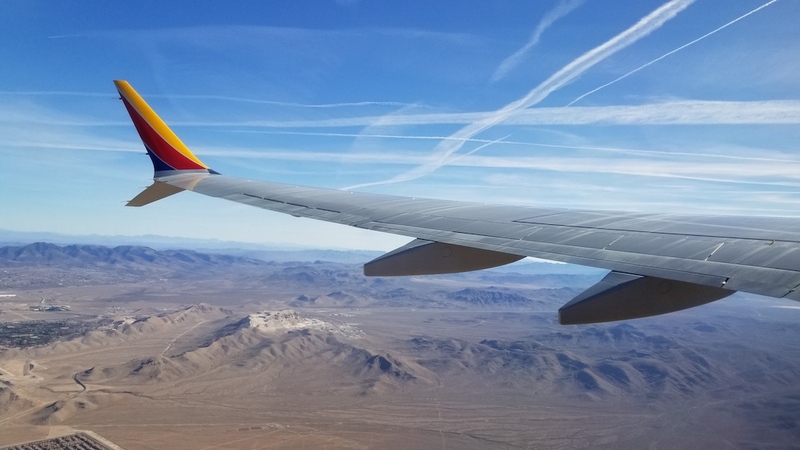 Have you flown Southwest, how was your experience? Leave a note below and let me know how it was. I haven’t flown Southwest for a long time. I don’t think they have a large footprint at my home airport, PHL. Are they now listed on the flight search sites like Google flights and Skyscanner? What are the new features on the Max 8? You did mention it was quite quiet. Anything else? This was my first time in ages as well Suzanne. 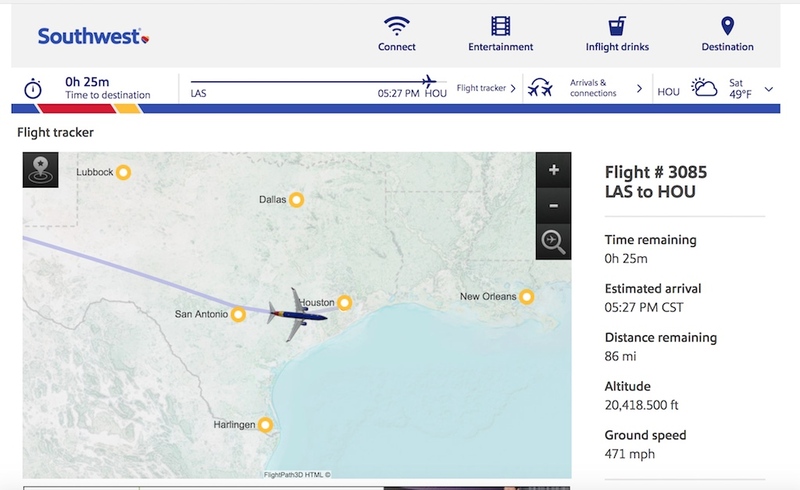 They do show up on Google Flights, and SkyScanner you just click a link to book them on Southwest’s Web site. 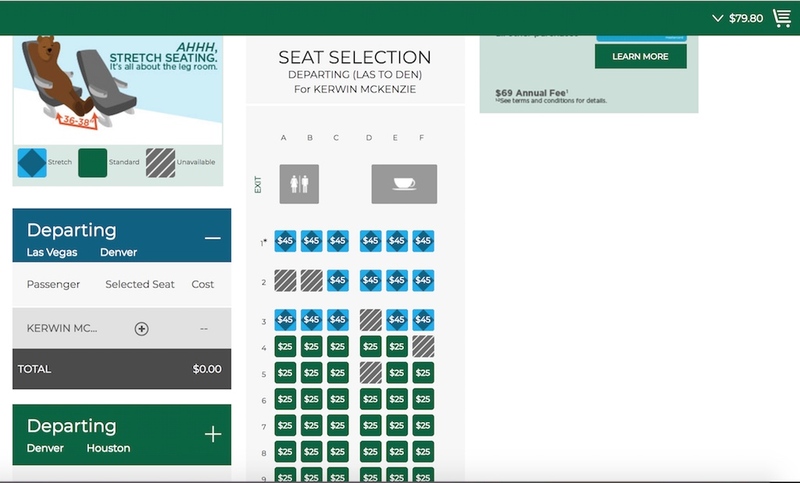 I use Momondo as I like the interface better and it seems to find better fares and shows a myriad of choices. The airplane is more fuel efficient and has a new interior design; the rest of the stuff are not customer facing. It actually has more legroom than other airplanes they fly as well. You can tell its a MAX as it has the perforations on the back of the engines and the funky looking wing tips :-).